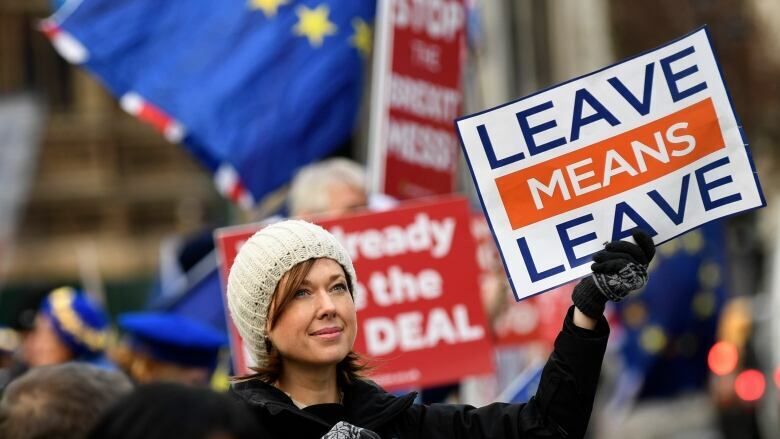 British MPs could vote down Prime Minister Theresa May's Brexit deal Tuesday, but not everyone is worried, according to an academic. "People are less panicked than you might expect," said Alan Wager, a research associate for The UK in a Changing Europe, an organization that promotes research into EU-U.K. relations. MPs are widely expected to reject the deal. A defeat would increase the odds of Britain crashing out with no deal, raising the spectre of customs checks, import delays and tariffs imposed as early as March 29. Wager told The Current's Anna Maria Tremonti the public understands the implications of leaving without a deal, "but there are still some areas that, until they see the effects of no deal, and the disruption that it might cause, people are still pretty skeptical — particularly leave voters." A lot of Conservative MPs share that skepticism, he added. "They argue that it's sort of a Project Fear, sort of scaremongering thing, but a lot of these effects are real, and would have a real effect on people's lives," said Wager. Wager spoke with Tremonti about whether this week could be "a moment of truth" for Britain's departure — and whether those who oppose May's deal have an alternative in mind. Produced by Ines Colabrese and Idella Sturino.